Hello everyone I'm Jack Red, there are so many retro inspired clone consoles. 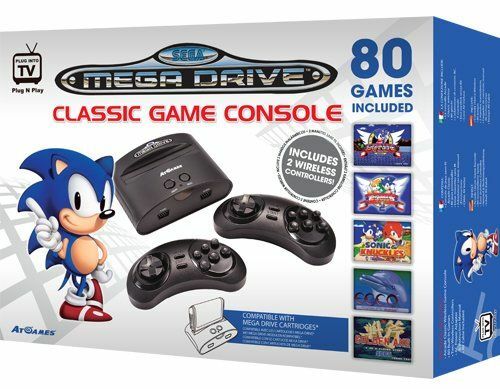 Why not look at AtGames' Sega Genesis Classic Game Console. Many people including myself grew up an Sega Genesis. There are several third party models including Model 3 and this often nick name as Model 4. This is suppose to bring nostalgia for those that had an Genesis but kinda falls short. Just in case you're wondering how short? Both Sonic's Ultimate Genesis Collection & Genesis games on Steam are way better overall to get your hands on. Easily AtGames Model 4 simply can't compete with those two compilations. I do respect someone wanted to bring Genesis back into our homes. But why are there several variations of it? Two of the most recent versions comes with MK1-3. It is no secret Genesis controller still stands as one of my absolute favorite controllers. How did they ruin having wireless Genesis controllers? You have to get several triple A batteries that will quickly run out. As far as I'm aware of there doesn't exist an rechargeable batteries that size or an battery pack for those controllers. You have to strict your movements otherwise your games becomes unresponsive. This thing is easy to hook up but the wiring not made for HD TVs. This means unless you go out of your way to buy extra stuff you need. You can't play these Genesis games on your HD TVs. One of the key reasons why Mini NES is beating it very bad right now. Speaking of it, most Genesis compilations comes a lot closer than how it sounds right off the console. Sadly this Genesis model has possibly the worst Genesis recreated audio I ever heard. We haven't got to the deal breaker yet. The very thing that almost got me to not buy one of these. Right on the box it says there are eighty Genesis games. However this could differ depending on deals. Some have five to ten extra games on an custom Genesis cartridge. It doesn't matter because half it's total games aren't Genesis. They're actually horrible homebrew games not made on the console at all. If you seen a lot of homebrew Genesis games then you know why this is a problem. They flat out lie to us about having the complete Genesis experience. One good thing I can say about it is the actual console can fit anywhere due to being small. You also can play many Genesis games not included in the console itself. You do have to often check the internet for games to not buy to save money. You also can play real Genesis controllers with some variations of it to work on this console. It does some things it promises while falls flat on them. There really isn't an excuse for the audio, limited movements on wireless controllers or half the games are homebrews. Most of those homebrew games are more like educational games or cheap knock off of other games. Most of them doesn't even take time to properly explain what you need to do. Thus making the experience of playing them more frustrating. They is no real point even having them in the collection of games included. For crying out loud one of these games is called Mr. Balls lol. A good number of them are virtually the same game with slight changes. Which bags the question Sega owns a large number of Genesis games. Why isn't some of the classics aren't included or at one point was included to be replaced in later versions. It should be a crime for not having the Streets of Rage trilogy included. Those games even SOR3 are truly amazing for their time that's no excuse for that. Yes you can play actual cartridges on the console. This is exactly why Sega fans nick named it as Model 4. Oh wait it actually gets worse, some exclusive deals included extra games. No not real Genesis games more of the homebrew garbage on a cartridge. I mean come on we need more real Genesis games. Even Sega Genesis Flashback based on what I heard also included some Game Gear & Master System games. It is truly Sad not once Sega decided to end AtGames' control of Genesis models. Thankfully a different company in Brazil aka the capital of the most faithful Sega fans. They recently got a new Sega Genesis model. Based on what I heard of it, I would say it might be a little on the expansive side. At the same time you are getting a great Genesis model that is similar enough to the official models back in the day. The actual AtGames Genesis model is small enough to be a little bigger & wider than some large Genesis cartridges. You would be surprised which third party games gets allowed in some versions. In one of them has both Street Fighter II games. Most later versions has Mortal Kombat 1-3. I had all four Mortal Kombat games on the console growing up. Which bags a even bigger question why wasn't UMK3 not included instead of MK3? Everyone widely agrees UMK3 is much better in so many ways. Personally my favorite version of MK3 is Mortal Kombat Trilogy on PlayStation. I would say if for whatever reason you can't somehow get a real Genesis in your house. You could buy one of these but seriously what's the point? I highly recommend Sonic's Ultimate Genesis Collection & Sega Genesis Classics on Steam over this. At least they're way more accurate in the audio & controls. This console doesn't even come close to being legendary as the real deal back in the 90s. I guess I should give a huge shout out to Dan & Greg of Console Wars. These guys has been doing so many Genesis vs. SNES episodes. They actually have enough of them to do them for a few years I'm not kidding. If this show doesn't give you an idea why Genesis meant so much to me as a kid or gamer. I felt this console is letting all of us down. Sega could easily do much better than AtGames aka the LJN of Sega stuff lol.